ADV-1000 - Professional Integrated Receiver/Decoder | AdvancedDigital Inc. 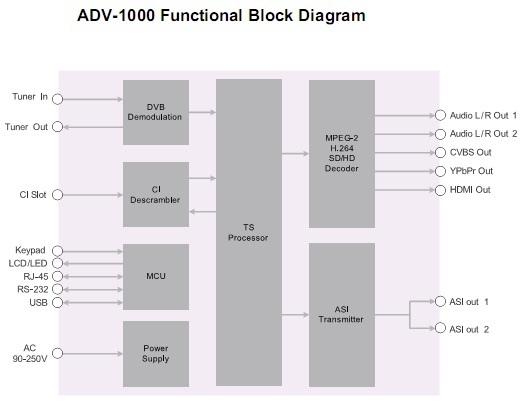 The ADV-1000 is a cost effective professional integrated receiver decoder. It is widely used in the satellite, cable and terrestrial TV network with different tuner frontend DVB-S2/S, DVB-C and DVB-T/T2. It demodulates the RF signal to the transport stream with ASI. With dual DVB common slots, ADV-1000 works with most of the well known CAS in the market and decrypts multiple services in a transport stream. The on board decoder can process a variety of digital video and audio formats in MPEG-4 AVC/H.264 and MPEG-2, in Standard Definition and in High Definition. The TV channel is decoded to digital and analog outputs, HDMI, YPbPr, CVBS, balanced and un-balanced audio. The powerful demodulation, decryption and decoding capabilities, combined with user friendly WEB GUI and SNMP based remote control makes this equipment one of the most competitive professional IRD in the market. • Audio decoding: Analog, Embedded and balanced (600 Ohm) XLR audio output ports.